It’s the first single from the L.A producer’s upcoming album. 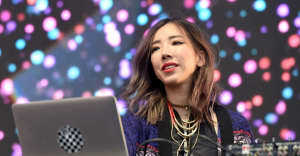 The L.A based producer, TOKiMONSTA is know for her unique blending of sounds and her latest single “Put it Down,” is no exception. The textured track pulls a variety of melodic samples together to create a sound that is airy and light. But when fellow Cali producer KRNE comes on the track, his pulsing beats and percussion play against TOKiMONSTA’s lush sound. Yet it’s an appearance by rapper Anderson .Paak, vocals that bring the whole song together: Still with you from day one/ Can’t forget where you came from – he raps. It appears the love is mutual, as KRNE explained in an email to The FADER. "'Put it Down' was one of those tracks that just came together quickly," he said. "I showed Toki these chords one day and she heard something in them that I missed—she really elevated everything to a whole different level. And Anderson .Paak was the perfect person to tie everything together." TOKiMONSTA's new mini-album Fovere, drops January 29 via Young Art Records. She says that Fovere is her most complete work to date. In addition to this song, it will feature collaborations from Jonny Pierce of The Drums, Kiya Lacey, and Gavin Turek. Check out the song below and be sure to catch TOKiMONSTA live on her current Fovere 2015 Tour. 12/03 Brooklyn, NY - Rough Trade # - Sold Out!